This program features the inclusion of both Medical and Engineering education at both undergraduate and graduate levels. That is, in this curriculum which is tailored towards developing a mindset for innovating medical instruments, medical students will learn modern engineering craftsmanship from engineering research staff, while engineering students participate in a research seminar where they can experience modern clinical tests using medical instruments. 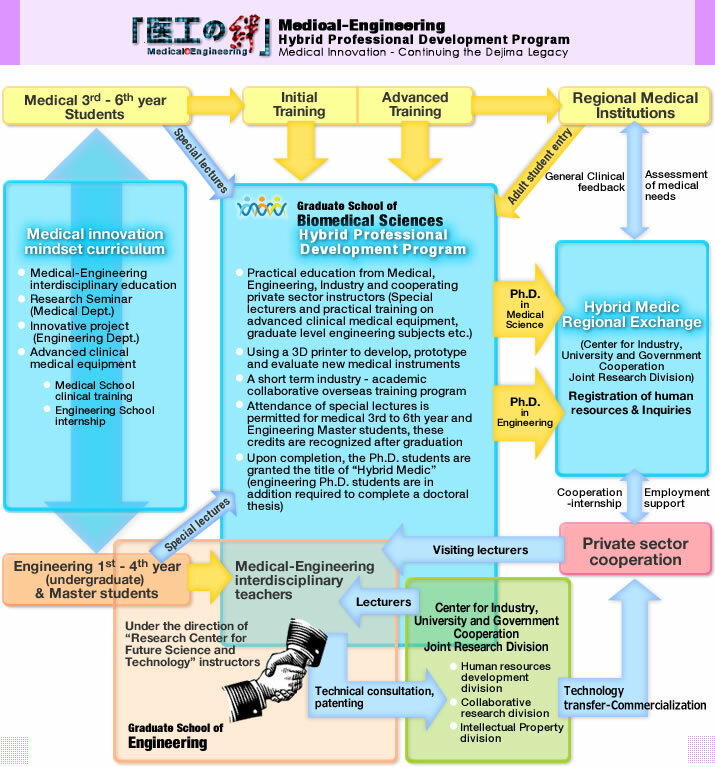 In the Hybrid Medics Professional Development Program, graduate students from both Medical school and Engineering Master students progress to acquire an advanced yet practical education in both fields from instructors from the centers for Industry, University and Government Cooperation Joint Research divisions and collaborating private sector businesses. As a result it is expected that the students will be able to view things from a different perspective, give birth to new ideas, and learn to be innovative, thus leading to a continuation of the Dejima mindset and the development of Hybrid Medic Professionals. Medical and Engineering interdisciplinary education provides a basic understanding in both Medical and Engineering fields, furthermore by working in collaboration with industry cultivates professionals with a broader perspective. While studying both medicine and engineering it will be possible to innovate new medical instruments. Rather than only passively learning, actively working to developing devices. Using a state of the art 3D printer design and prototyping of medical instruments is possible at any time. Ideas can be transformed into reality “as is”. With the aid of 3D printing the complete process of design through to clinical trials is possible. Proof of design effectiveness can be carried out in a short period of time. Engineering graduates can receive a medical Ph.D.
Papers may be presented at medical or engineering related conferences or published in either journals. With the collaborative input from both engineering and medical lecturers engineering majors can take part in medical practicums and medical majors can take part in engineering practicums. Assistance is readily available from both medical and engineering specialists. In collaboration with Leiden University in the Netherlands a short term study program is provided. At Leiden University, world class collaboration exists between the Medical and Engineering departments, here students will receive training and experience the effectiveness of such an affiliation.